Could We Build the Millennium Falcon from 'Star Wars'? 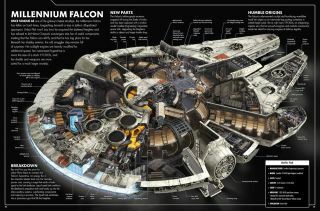 Illustrator Kemp Remillard detailed the interior of the Millennium Falcon. With so many incredible, newly developing technologies, could we build a real-life Millennium Falcon? In short, no. But we're getting closer. In the "Star Wars" universe, the Millennium Falcon is heralded as the coolest ship around. The cargo vessel that Han Solo originally won from Lando Calrissian in the Cloud City Sabacc Tournament, the Millennium Falcon lies at the center of some of the most incredible adventures in the series. The Millennium Falcon's signature speed comes from its hyperdrive, a propulsion system that pushes the vessel to light speed — though Han Solo has famously boasted that the ship can travel even faster. The hyperdrive functions by using "hypermatter particles" to send the craft into hyperspace, an alternative dimension reached by traveling at or beyond the speed of light. This technique uses wrinkles in the fabric of space-time, or wormholes: pieces of the fabric that fold over to connect two otherwise-distant points. Now, while the theory of general relativity does predict wormholes, they are still just a theoretical phenomenon. So, because we can't prove their existence, we certainly can't manipulate them for our own purposes. Stephen Hsu, a professor of theoretical physics at the University of Oregon, told our sister site Live Science, "You would need some very exotic type of matter in order to stabilize a wormhole, and it's not clear whether such matter exists in the universe." Now, there is some excitement in the scientific community surrounding an engine called the EmDrive. This is not a hyperdrive, or a warp drive as some have suggested. But it bounces microwaves around a chamber as a substitute for propellant. Recently, researchers put the EmDrive to the test and found that the thrust it produced comes from some kind of electromagnetic interaction that is likely between the engine's power cables and Earth's magnetic field, according to their study This might not be the end of the EmDrive as a potential, future engine — but it certainly isn't a hyperdrive. At 1 g, we can still push blood up to our brains, but as the g's increase, this becomes more difficult. Twelve g's is about the maximum that jet-fighter pilots can experience before passing out, but this assumes they're wearing g-suits, which squeeze the legs in high-g situations to prevent blood from being pushed down. So, theoretically, without high-g suits, the human passengers aboard the Millennium Falcon would black out when the ship took high-g turns, even without traveling as fast as Han Solo has bragged it can. At Chewbacca's request, a hologram "chess," or holochess, table was installed on the Millennium Falcon so passengers could play Dejarik, a classic strategy game in the "Star Wars" universe. But while astronauts aboard the International Space Station won't be playing Chewie's favorite game anytime soon, hologram technology is inching its way into modern spacecraft. In 2016, after some launch difficulties, two of Microsoft's HoloLens AR headsets traveled to the space station to aid crewmembers. Additionally, the innovators behind the Voxiebox have built an early version sort of holochess. You can't feel the pieces or move them with your hands — but this feature is not far off, and researchers have already gotten close. In one example, reported by Wired, teams from the University of Tokyo and the Nagoya Institute of Technology in Japan have created small, plasma holograms that you can feel with your hands. Aboard most ships in the "Star Wars" universe, and throughout sci-fi stories, deflector shields are a staple security measure. Whenever conflict arises, deflectors go right up, keeping the ship intact despite enemy attacks. But is this just a well-worn science fiction trope? Not exactly. Back in 2014, ExtremeTech profiled a team of students from the University of Leicester in the United Kingdom who considered the possibility of using plasma to build such a deflector. The students took notice of the Earth's ionosphere, a part of the upper atmosphere that contains plasma. Currently, we bounce communication signals off of the ionosphere's plasma to send them to different locations on Earth. This "invisible shield" around Earth was the inspiration for this team's suggestion that you could use and manipulate plasma to deflect electromagnetic radiation — such as that coming from an energy-based or laser weapon, possibly. Such a shield isn't technically feasible yet, but their general concept to use plasma to deflect radiation is certainly within the realm of possibility. Additionally,in 2008, Ruth Bamford of the Science and Technology Facilities Council's Rutherford Appleton Laboratory in England and her colleagues studied the possibility of deflecting radiation using a portable magnetic shield. While it's not the battle-ready deflector we've seen in Star Wars, it's definitely a step in that direction. Other than its description as a power source for starships like the Millennium Falcon, the Quadex power core is a fairly mysterious technology. The series never explains how the power core operates, so it is equally possible and impossible that we could build one. Some of the Millennium Falcon's most powerful and most-used weapons, its quad laser cannons are also relatively feasible. The U.S. military's Defense Advanced Research Projects Agency (DARPA) has spent years developing the closest thing we have to a "Star Wars" style laser cannon. It can fit on a fighter jet but is still powerful enough to shoot a 150-kilowatt energy beam. Additionally, researchers have suggested that a coherent amplification network (CAN) laser, a beam created from multiple small lasers, could get rid of space debris surrounding Earth by vaporizing a thin layer of matter off of the surface of the space junk. This would push the debris downward, where it would burn up in Earth's atmosphere. Laser weapons may currently be large, dangerous and difficult to create, but they are certainly possible. The technologies aboard the Millennium Falcon are not a constant. The ship is an ever-evolving amalgamation of assorted, stolen, customized and found parts. It might seem odd that a highly capable future ship could be assembled this way — but when you think about current spaceflight advances, it makes sense. The Millennium Falcon has a lot in common with SpaceX's Dragon, whose reusable design is optimized for efficient, sustainable launches. Similarly, the Millennium Falcon's design relies on the reuse of found parts. With long-term space travel, tech aboard a ship would occasionally break, become obsolete, etc. It might not always be possible to 3D print new items or make repairs with what is already available on a ship. Future space travelers might do what Han Solo has done and repurpose found parts to efficiently survive in the cosmos. The Millennium Falcon boasts a seemingly endless list of gadgets and capabilities. From its oversize sensor dish to its Gigyrodyne sublight engine, thrust-pressure manifold and sensor-proof smuggling compartments, the tech aboard this ship ranges from highly plausible to entirely fictional. So, humanity is not quite ready to build a Millennium Falcon. Still, many developing technologies could one day make onboard tech like laser cannons and invisible deflector shields a reality. Until then, we can always watch Han Solo and company zip through the galaxy on one of science fiction's most iconic ships.